As #TIFF17 wraps up, a jolt of jazz will rock Toronto’s Kensington Market. 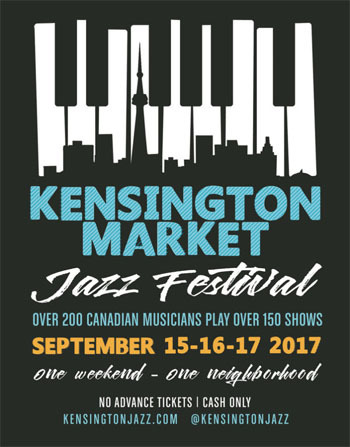 Founded by renowned singer-songwriter, broadcaster and philanthropist Molly Johnson, the second annual Kensington Market Jazz Festival will showcase, promote and celebrate Toronto, our “music city” by presenting over 250 jazz musicians performing in 20 spots over 3 days at #KMJF17, September 15, 16, 17 in Toronto. Peter Goddard of the Toronto Star calls her “A hugely original musical mind at work.” Acclaimed across the globe for her soulful, original approach to jazz, Elizabeth Shepherd is a pianist, vocalist, composer, bandleader and recording artist. Born in Montreal, she spent nearly a decade on the Toronto scene before relocating to her home province. In addition to the intimate performance at Poetry, Shepherd will perform solo at Tom’s Place Piano Room and will be accompanying several other artists throughout the festival. Montreal-born guitarist and composer Eric St-Laurent spent his formative musical years on the scenes of Berlin and New York. His shining energy and musical enthusiasm are contagious, especially in the company of bassist Jordan O’Connor and percussionist Michel DeQuevedo who collectively form the Eric St-Laurent Trio. On Sunday September 17 this year Eric St-Laurent has curated the World Jazz Series fort KMJF which precedes his own set at Lola at 10pm: “The Sunday lineup at Lola’s is about improvisation in world traditions outside of North America. In a way, jazz is as old as the world itself. Come to Lola’s and let us show you what we mean by that.” Performing as part of the World Jazz Series on Sunday September 17 at Lola: 4pm Donné Roberts; 6pm Hairbrain feat. Anh Phung and Alan Mackie; 8pm Selçuk Suna Ft. Dia. KMJF has curated acoustic series at 10 non-traditional music venues, some of the neighbourhood’s favourite stores and restaurants. Participating spots include Fresco’s Fish and Chips (201 Augusta Ave), book shop Good Egg (267 Augusta Ave), clothing store Model Citizen (279 Augusta Ave), bakery Wanda’s Pie in the Sky (287 Augusta Ave) and Jimmy’s Coffee (191 Baldwin St). Friend of the festival, Tom Mihalik’s of iconic suit store Tom’s Place (190 Baldwin St) features a Yamaha Grand piano with sponsored appearances by twelve artists including Order of Canada Officers Don Thompson and Joe Sealy, last year’s JUNO winner Robi Botos and rising star Carl Bray. 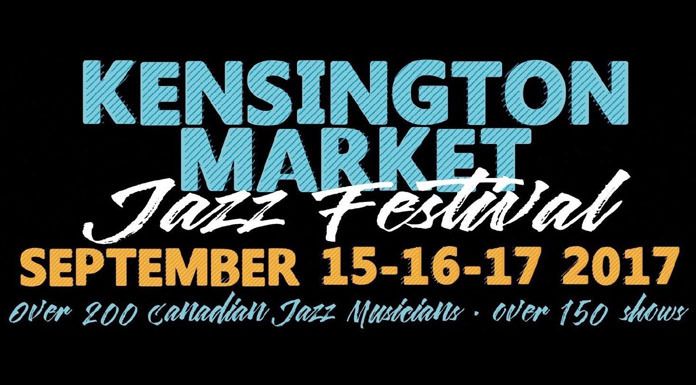 The Kensington Market Jazz Festival is a not for profit organization lead by Molly Johnson and commited to presenting live music in the heart of Toronto’s heritage market neighbourhoood throughout the year and with a 3 day festival September 15, 16 and 17th, 2017.